Top 10 Dog Foods 2018: What is the Best Dog Food Brand Today? Our editors spent many hours researching the pet food market, reading about and testing to answer the ultimate question: "what is the best dog food brand?" After many days of work, we've come up with a list of top 10 dog foods with picks for the best dry dog food, canned dog food, best puppy food brand and others. Top 10 Dog Foods: What is the Best Dog Food Brand? The problem with the pet food market is that very few companies care how their dog foods affect our pets. The focus of most dog companies isn't finding out what is the best dog food brand for optimum health of our dogs; it's the nutritional sustainability and cutting costs. Frankly, many pet owners are tired of feeding dogs commercial diets that eventually lead to more health problems. So after weeks of our dog food analysis and research, we managed to pick top 10 dog foods. Research shows how quality of ingredients directly affect health of dogs¹. In fact, it's possible to alleviate many conditions in dogs, such as canine arthritis or hip dysplasia with proper pet nutrition². Drawing from conclusions of many dog experts, dog food reviews, studies and vets³, it appears that a holistic approach to dog nutrition with all-natural and human-grade ingredients is the best way to keep our dogs healthy. * Please click on the dog food brand for more product details and prices. Alternatively, scroll down to read the review of each dog food. The Honest Kitchen’s Dehydrated Food was chosen as the top best dog food brand with FDA-approved human grade ingredients. Dehydrated dog food is the closest thing to fresh, whole food and the next best thing to making homemade dog food. However, no one single dog food brand can be the best for all dogs, according to science and veterinarians. We picked top 10 dog foods which are accepted as best dog food brands healthy for most dogs. This way you can choose what best fits your specific dog. What you feed your dog will highly depend on several factors: dog's age and his genetics, current health condition, activity levels and a few other aspects of his day to day life. We even had a whole podcast episode dedicated to discussing the safety of commercial pet foods and what to look out for. Why The Honest Kitchen Dog Food? How other dog food reviews and websites rated this brand? What do I know about dog food? Can best dog food brands improve my dog’s health? Who should buy best dog food brands? Every one of these top 10 dog foods have been taken out of specific categories that we managed to research. That is best canned dog food, best dry dog food, best dehydrated or raw dog food, best puppy food and so on. We've considered the expense of every dog food brand and how much dog food costs. Pet parents believe that their dog will receive a balanced diet from commercial dog foods that are often picked as top 10 dog foods on many dog food reviews websites. Sadly, that isn’t true. Finding out what is the best dog food brand for your specific dog and his health doesn't mean that evaluation of ingredients alone is enough. Furthermore, research shows how majority of commercial dog food diets are often mislabeled. It's not uncommon for these diets to be full of artificial stuff, colors, flavors and fillers that offer no nutritional value and potential side effects. Thus, it's important to consider these factors as well. We all know that everything our dogs eat has a direct effect on their health. If they eat something toxic, they're going to get sick . If they eat appropriate supplements, that will have a positive effect on their health. The same is true for the everyday diet . The best dog food brand will benefit our pets' overall health and well-being while providing them with the energy that they need throughout the day. But finding truly best dog food brands that are healthy is no easy feat. It’s vital that as dog owners, we pay close attention to the food we feed our pets and that we know exactly which is the best dog food brand with healthiest ingredients that are 100% safe for dogs. From table scraps to commercial dog food diets, there are pros and cons to every canine diet and recipe. Veterinarians and dog nutritionists can be very helpful in determining best dog food to feed your dog. A quick consultation with a vet may be the most important thing you ever do for your dog, too. When you eat well you feel well – and the same can be said about your dog. Many common canine conditions like dry and itchy skin, excessive gas, upset stomach and a dry, dull coat can all be linked to improper diet. Switching your dog away from high processed commercial diets and onto the holistic approach such as The Honest Kitchen Force Grain Free formula can have immediate effects for a dog's overall health. It appears I'm not the only pet owner who was extremely excited to discover and try The Honest Kitchen's range of dog foods. As I was doing my research, I found many people to share my views on this. Dog owners who also reviewed this dog food brand agree with my Honest Kitchen dog food review and the points I make here. Indeed, processed dog food can be thought of in the same light as processed foods for human. It’s no better for your dog than greasy fast food is for you. Minimally processed dog food that is made with whole food ingredients will work for your dog’s body the way that fresh fruits and vegetables work for yours. We have found that all the ingredients in The Honest Kitchen dog food are actually superb for pets, and contain no artificial stuff. The poor ingredients found in many other dog food brands such as artificial flavors and byproducts may not affect your dog immediately, but over time they will make him feel sluggish or even lead to disease or illness . * Scroll down for a complete breakdown and a detailed The Honest Kitchen dog food review. We've previously written about The Honest Kitchen making headlines all over the Internet with their breakthrough holistic dog food formulations and human grade ingredients, as well as their very healthy chew treats for pets made from natural and wild caught Icelandic fish. It’s true that higher quality pet foods cost more, but they will actually save you money in the long run. Personally, I believe that if your dog is healthier he won’t need to go to the vet as often, and a healthier dog means that it’s less likely you’ll have emergency veterinarian expenses pop up. Depending on your pet’s size, age and breed, his individual dietary needs will vary . Commercial diets are typically formulated for one specific group or age bracket, and come in many different price ranges from extremely cheap dog foods to very expensive ones. For example, you can purchase dog food for puppies, senior dogs, active dogs and dogs that need to lose weight. Higher quality diets, like dehydrated dog food from The Honest Kitchen, offer whole food nutrition that incorporates all the dietary needs of a canine, meaning it is a suitable diet for virtually any dog . A balanced diet that dog foods such as The Honest Kitchen provides won’t require as many additional dog supplements either. Best dog food brands will promote a healthier skin and coat, so your grooming costs will be cut. A high quality diet will also aid in proper dental health, meaning your expenses on dental cleanings and other dental health needs will be reduced too . Force is one of the most popular Honest Kitchen recipes. This dog food has been formulated to be ideal for adult dogs of all breeds and sizes. Ingredients (all ingredients dehydrated): Chicken, organic flaxseed, potatoes, celery, sweet potatoes, apples, organic kelp, honey, pumpkin, green beans, cabbage, bananas, papayas, basil, garlic, tricalcium phosphate, choline chloride, zinc amino acid chelate, vitamin D3 supplement, vitamin E supplement, potassium iodide, potassium chloride, iron amino acid chelate, copper amino acid chelate. Meat and protein content matters for dogs, and for this brand. Main meat source – chicken. A 10 lb box of Force contains 16 lbs of free-range chicken. Chicken is a good source of protein, niacin and B6, which helps to support energy metabolism for dogs. The Honest Kitchen's free-range chicken is from Petaluma Poultry, in California, USA. It is USDA certified free-range, humanely raised, vegetarian fed without the use of animal fat or by-products and is never fed antibiotics. Veggies and fruits are also here. A 10 lb box of Force contains 1/2 of a small pumpkin, 1 1/2 bunches of celery and 2 1/2 bananas. Pumpkin contains potassium, iron, vitamin A, B-complex, C and E, as well as antioxidants. Pumpkin is low in calories and fat and high in dietary fiber. The Honest Kitchen’s pumpkins hail from South America and Mexico. Celery is a great source of potassium, folate, calcium, magnesium, vitamin A and vitamin C. This celery is grown in Europe. Bananas are a good source of potassium, minerals and vitamin C. Bananas contain all 8 essential amino acids and are filled with vitamin B6, C, carotenoids, fiber, magnesium, and potassium. These bananas are from the Philippines. However, Force isn't this company's only food, and they have a range of other incredibly healthy options. Most importantly: By now, as owners we understand that all-natural and holistic approach to canine diet is the only way to move forward, and the pet food market must react. It's a fact that The Honest Kitchen is one of the most unique pet food manufacturers out there. As owners, we have to embrace these brands as a sign for other companies to adopt the same manufacturing practices to ensure better quality of all pet food. I've done more research on this manufacturer. As a company, Honest Kitchen company produces a line of FDA approved, natural, holistic, human-grade foods for dogs which are made with love in a human food facility and not in a pet food plant to maintain the highest possible quality standards. All of these dog foods are gently dehydrated to remove only the moisture, which retains the natural nutrients found in the fresh whole food ingredients. The Honest Kitchen's dog foods are developed with uncompromising attention to detail, by a company of pet lovers with a passion for food. And I'm not paid by this company to write about them, either. We all know that the better quality food we feed our dogs the healthier they will be. And holistic best dog food brands are healthiest for our pets. It's rare to find a brand that can equal The Honest Kitchen Force. What about reviews from dog owners? It seems that pet owners agree across the board on the quality of our pick for the #1 best dog food brand. However, they also seem to agree on the price – while arguably the healthiest dog food out there, Honest Kitchen comes at a price. The Honest Kitchen company has done some research, and the findings are astounding. They think of top quality dog food as preventative medication for your pet, and they wouldn’t to put their theory to the test. They polled 6,289 pet owners whose dog showed certain health conditions before they began eating food from The Honest Kitchen. Those are some pretty impressive figures. Both of our dogs (a 5-year-old boxer and an 8-month-old chocolate lab) are in good health. Our boxer does have a congenital heart condition, but it’s not something that would be able to improve because of her diet. However, we do make sure that we feed her a heart healthy diet to keep the muscles in her heart as strong as possible. I was skeptical that we would notice much of a difference by switching to The Honest Kitchen’s Dehydrated Formula's holistic dog food and I was surprised with the results. In our household, we already feed our girls a high-quality diet, but it’s a regular dry dog food kibble. The company suggests dividing daily amount of their holistic dog food into two servings for pets: one in the morning and one in the evening. These dog foods must be hydrated with water before serving, but you can add slightly more or less water suggested, according to your pet's taste. Remember to always refrigerate or discard any leftovers. If your canine is making a transition from a commercial processed foods or canned dog foods, this holistic food should be introduced gradually, over a period of 4-7 days depending on your pet's sensitivity. When your pooch is already eating raw or homemade dog food, this holistic canine diet can usually be introduced more quickly, over one or two meals. Begin the transition by adding just a small amount of the Honest Kitchen with some water added (see below) into your dog’s current meals. Gradually increase the amount of the Honest Kitchen while decreasing the amount of your dog’s original diet. This will allow the natural friendly gut flora in the dog's intestines to get accustomed to the new holistic canine diet and become more efficient at digesting this pet food. How much you start with will depend on the size of your dog and how sensitive he is to this change. For some, 1/4 of the Honest Kitchen dog food and 3/4 of the original canine diet may work well. For more sensitive dogs, begin with a smaller amount of food. For more robust stomachs, you may try half and half first. Feel free to adjust the amount and schedule to suit your pooch's individual needs. Another thing that needs to be mentioned one more time about switching your pet’s diet, and this comes from personal experience – it must be done gradually. Switching your pet to a new food without allowing the proper transition could have very bad effects on their digestive tract. It may make him very sick, so be sure to mix the food a little at a time until you have transitioned your pet completely to the new food . After a few weeks on this best dog food brand, I began to notice changes in our dogs. They consumed less water. This is because dehydrated food is mixed with water and helps to hydrate your pet as well provide him with nutrients. Dry dog foods can actually dehydrate your dog if he does not have access to enough fresh water. A high-quality food, like this one, has no fillers. Your dog will get more nutrition in a smaller quantity, meaning you’ll have to feed him less and he’ll be making less waste. We also noticed an increase in our older dog’s energy level. She’s only five, but she does have a heart condition which causes her to get worn out more quickly than the average 5-year-old dog. I was impressed with the increase in her energy levels after switching to this dog food. She played with our puppy for longer period of times and was much more active while outside than she normally is. The Honest Kitchen’s Dog Food is made with FDA APPROVED human grade ingredients. Most other pet foods are labeled as feed grade. This means that they may include fillers, chemicals, by-products and other ingredients that are not fit for consumption by humans. The Honest Kitchen blends their foods in a human facility that also makes bakery mixes and breakfast cereals. For this reason, they need to abide by the same strict standards for record-keeping, safety and cleanliness that all human foods must meet. The company qualifies for the label of human grade dog food according to the FDA regulations, because they meet all the required standards. This has been noted by many dog owners noted in their Amazon product reviews. This dog food is made with the same fresh produce, eggs, meat and other ingredients that you would buy a local farmers market or health food store. The only difference is that their recipes are specifically formulated to provide a canine with an extremely well-balanced everyday nutrition. This wraps up my Honest Kitchen dog food review, and I hope you enjoyed it. This was an interesting process to do all of the research in order to find the best dog food brands out there, but it's well worth it. It's worth it not only because I was able to find something that I know I will continue to feed my dogs with, but also because hopefully this will help other pet owners to make better choices in the future. Collectively, we can drive the pet food market in the right direction by demonstrating to companies what we will buy and what we don't wish for our pets. Competition in the market will bring down prices for this type of holistic dog foods, and ultimately, it's the pet owners and their dogs who win this long-overdue battle. Overall, this is easily the best dog food brand that is currently available from the pet food market. This has been confirmed by other dog food reviews and ratings websites, as well as owners who purchased this food. Unfortunately, there is one drawback – it'll cost a little more. But the nutrition, quality and safety of the ingredients for our canines are well worth it, in my opinion. Disclaimer: Honest Kitchen did not sponsor this dog food review, nor were they aware of this writing at the time of publishing. If you decide to purchase this dog food brand, please support the Top Dog Tips site by using our affiliate links on this page and we'll receive a very small commission at no cost to you. This will help us research and write more and better dog content in the future. Now, with the Honest Kitchen dog food review out of the way, let's get on with the rest of the list. I know that most dog owners feed their pet a dry kibble diet, and there is absolutely nothing wrong that. There are some really great dry dog foods on the market, and I’ve chosen Taste of the Wild Dry Dog Food as my top choice. This grain-free dog food is recommended for dogs of all ages as well, making it an excellent choice for a multi-dog household. This dry kibble is made with real roasted meat and supplemented with vegetables and fruit. Packed with antioxidants and highly digestible proteins, this dog food will support your pets immune system and his overall well-being. Their recipes also include pre-and probiotics to aid in digestive health. The company also includes proteinates in their recipes, which promote easy absorption of minerals. Taste of the Wild basis their dog food formulas on research that shows domesticated cats and dogs still share DNA with their wild ancestors. The company believes that if their DNA is the same, they are still craving the same types of food like fresh vegetables, fruit and meat. Dogs don’t craze the grain, soy and corn fillers used in many commercial pet foods; they want real, fresh ingredients . Taste of the Wild also offers blends for puppies, senior dogs and pregnant and nursing females. The minimum protein content in their adult dog formulas range from 25-32%. As you can see, they don’t offer dog food made with traditional protein sources like beef and chicken. This best dog food brand may be a great choice if your pet has sensitivities or food allergies, as many consumers noted in their product reviews on Amazon. There are pros and cons to canned dog food, but some pet owners don’t have a choice. Senior dogs and pets with poor dental health may have to eat canned dog food due to their inability to chew the crunchy stuff. Whether you choose to feed your pet an all-canned diet or you mix it his canned food with dry kibble, Eagle Pack Natural Wet Canned Dog Food is the best choice. Canned dog food is usually more palatable to dogs. If you’re a dry kibble feeder and you’ve ever mixed things up with a can of wet food you know just how quickly a canine will devour wet dog food. Canned dog food is made mostly of protein and fat. It doesn’t have as many carbohydrates as dry kibble, making it more appealing to your dog . Canned dog food is much easier for your dog to digest, but that also makes it messier when it comes out the other end. Canned food also does not provide the crunchiness of dry kibble. Did you know that crunchy food actually help remove plaque and tartar build up on his teeth? Canned food is also more likely to get stuck in gaps between teeth and cause decay. If your dog needs to eat a canned diet your vet will be able to explain some of the precautions and extra care that you should take. If your pet doesn’t need to be on an all-wet dog food diet, you should speak with your veterinarian about the best choice for him. Mixing it with a bit of dry kibble may be more beneficial for your Fido. Like the top two choices on my list, this food is formulated for all breeds, ages and sizes. This best dog food brands from Eagle Pack is made with 100% all natural ingredients with no artificial colors, flavors or preservatives. It’s also made in the United States. All blends of this dog food include easily digestible protein as the first ingredient. Brown rice, tomato pomace and oatmeal are used for their natural nutrients, added fiber and digestive support. Flaxseed in included for skin and coat health, and Eagle Pack also adds additional vitamins, minerals and antioxidants to give your dog a complete and balanced meal. Many consumers use these best dog food brands as a topper for their dog’s dry kibble, as mentioned in their product reviews. I chose Castor & Pollux Organix Dry Dog Food as my top choice for the best dog food brand that is organic. The protein source is the first ingredient in every recipe. For example, in the Chicken & Brown Rice recipe real, organic chicken is the first ingredient. The company uses organic quinoa, because it is a nutrient-rich grain that provides a gluten-free source of fiber. Organic flaxseed is also included in their best dog food brand recipes as it is a great source of omega 3 fatty acids, which foster skin and coat health. Castor & Pollux dog food is made in the United States and the company says that it never sources ingredients from China. They make their food in an Organically Certified kitchen too. If you keep up with pet product news, you know that there have been many issues and recalls on products that were made in or made with ingredients from China recently. 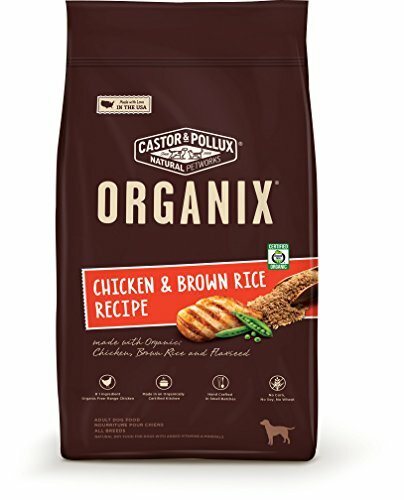 Castor & Pollux makes many different blends of their Organix dog food. You’ll have to decide which one is right for your pet. You can choose from adult dog, small breed, large breed, puppy and healthy weight recipes. Consumers really enjoyed all the different choices, which you’ll see mentioned in many of the product reviews on Amazon. All puppies are different, and all puppies have different nutritional needs. It is best to check with the breeder that your pup comes from or with your veterinarian to decide which diet you’ll feed your puppy before you even bring him home. Depending on the age and breed of your puppy, his nutritional needs will vary. Adult dogs weighing less than 20 pounds are considered small breeds. Small breed puppies grow much quicker than large breed puppies. They can reach full maturity by 9 months old, whereas large breed pups may not mature fully until they are 15-24 months old . Most puppies should be fed puppy food until they have reached full maturity, but again it is best to check with your vet about your dog’s specific needs. There are hundreds of dog food brands that claim to be specifically formulated for puppies. During my in-depth research I realized that many of these foods are very similar to the brand’s adult dog formula, they are just made into smaller kibbles and have a few additional vitamins and minerals. Puppies, like human babies are developing quickly and they need a special blend of food that will foster that rapid growth. Halo Purely For Pets Spot’s Stew Puppy Formula is the best dog food brand choice if you’re feeding a young pup. This is a holistic puppy food, meaning that the blend focusses on the whole animals, not just a certain system or particular aspect of the canine. It is made with natural ingredients, and is fortified with added prebiotics, probiotics, vitamins and minerals. This best dog food brand from Halo contains no artificial ingredients, wheat, corn or gluten. They don’t use rendered meats or plant or animal by-products. The ingredients include things like whole eggs, butcher-quality chicken and farm-raised vegetables. A few pet owners mentioned that their dog didn’t like the flavor of this puppy food in their product reviews. The vast majority of pups enjoyed it, but if yours doesn’t like it or if you’re unsatisfied for any reason you can send the unused portion back and receive a full refund. I like this option and it’s not offered by many pet food manufacturers. It’s impossible to tell if your pet will like the flavor of a product before you purchase it, so it’s nice to know that you won’t waste the money buying a bag of this food and then having to throw it out if Fido refuses to eat it. So what is the best dog food brand in my opinion after all the research I've done? Shopping for the best dog food brand can be a daunting and frustrating task. There are thousands of different brands and recipes available. There are also many different levels of quality. You need to be sure to select a high quality dog food that will benefit your dog’s overall health and well-being. The Honest Kitchen’s Dehydrated Pet Food for Dogs provides complete and balanced nutrition for dogs of all ages. It’s all-natural, grain free and even made with human grade ingredients. If none of these choices for the best dog food meet your dog’s individual needs, that’s okay. There are five more excellent choices that I’m going to share with you in a minute, but first let’s discuss how I researched these choices and made my selections for the best dog food brand in each category. Can the best dog food improve my dog’s health? Who should buy dog food? Before buying dog food you need to know how to read and understand the label on the product. Unfortunately, government regulations on pet food are not nearly as strict as the regulations for human food. This means that there are many loopholes that dog food manufacturers can use when labeling their product to make it seem healthier than it actually is. Label items, such as the ingredients list and information panel (the part that shows the recommended feeding breakdown and the guaranteed analysis of the dog food), can be very confusing . Each part of a pet food label is required to contain certain information, and if you know what to look for it will be much easier to make the best dog food brand selection for your canine companion. You also need to know that you’re going to get what you pay for in regards to dog food. Yes, the higher quality foods cost more, but they are worth it. Picking a dog food based purely on price is a terrible decision. You will pay less and your dog will suffer for it. I’ll admit, there are many dog foods that are super healthy but also super expensive – too expensive for many dog owners’ budgets. You need to find a happy medium. Choose the best quality food that you can afford. Honestly, if you can’t afford to feed your dog a healthy diet you shouldn’t adopt one in the first place . Waiting until you can afford to provide your pet with quality care is much better option than settling for lower quality care because it’s all you can afford at the time. I’ve been a dog owner my entire life. We’ve had puppies, senior dogs and dogs with food allergies. We’ve dealt with canine obesity and have tried more dog food brands and formulas than I can count. Foolishly, there was a time that I chose my dog’s food based mostly on price. Now I know better. We’ve used everything from the top of the line, super expensive dog foods to prescription diets. Now we have two fairly healthy dogs that are at their optimal weight and we are using a dog food that floats somewhere in the middle of the pack. It’s not the most expensive brand out there, but it’s healthy for them and we’ve noticed a lot of positive changes in their health since making this switch. Over the years I have learned a lot about proper canine nutrition from our veterinarian and from my own personal research. I honestly feel that I know more about dog food than the average pet owner. I often find myself being asked by family and friends about recommendations for pet food. I certainly wouldn’t call myself an expert or canine nutritionist, but I do have a lot of knowledge and a lot of experience with dog food. Absolutely! This should no longer be a question if you’ve read this entire article. However, if you’re just jumping in now I’ll try to give you the condensed version. The best dog food brand will absolutely improve your dog’s overall health and well-being. You’ll notice differences internally and externally. The best brand of dog food will make your dog’s skin and coat healthier, aiding in his external appearance. You’ll also notice the signs of a healthier digestive tract including less gas, healthier stool and easier digestion. The best dog food will increase your dog’s energy level and improve his dental health too . Feeding your dog a diet that caters to his individual needs will drastically improve his health and wellness. If you have a senior dog, the best dog food brand should aid in joint health and give him energy. The best food for puppies will help them grow and develop, as their bodies are changing so quickly. If you make a wise choice and feed your dog a healthier, quality food you are sure to notice health improvements shortly after transitioning his diet. Yes, it seems like a silly question. Of course every dog owner needs to buy dog food. You don’t have a choice. Whether you feed your pet a raw diet, organic diet, dry kibble or canned dog food you need to buy some type of food for him. As I mentioned earlier, it will benefit both you and your Fido if you buy the best quality dog food that you can afford. It may seem like a lot of money to spend now, but high-quality dog food will end up saving you money in the long run, because your dog will be healthier. That means fewer vet bills, supplements and medications in the long run. Proper nutrition will also add years to your dog’s lifespan, which you’ll be VERY thankful for down the road. I knew there were thousands of dog food brands and formulas on the market, which meant there was sure to be hundreds of products that were healthy and safe. Creating this list started with a lot of research about what pet owners should be looking for when shopping for dog food, how to read dog food labels and all the different types of canine diets that are available. I spoke with my veterinarian before writing this article to get to the bottom of some of the most frequently asked questions about pet nutrition. We chatted about the safest diets for dogs, common food allergies and the artificial ingredients and by-products that make up many commercial pet foods. There are many common misconceptions about the pet food industry, but a lot of the stories that you hear are actually true . Once I had a good understanding of what makes a high-quality dog food, I began researching the options available. It was easy to see that there were a lot more poor quality products on the market than I expected. About 1 in every 4 dog food products that I looked at were healthy, safe and offered balanced nutrition. That’s when I went to the customer reviews. I wanted to know what pet parents who had actually tested these best dog food products thought. I culled through hundreds of product reviews. This also gave me a good sense of the palatability and appeal that the foods had. Did dogs like the dog food? Were owners impressed with the health benefits? Did the dogs have any side effects when their diet was switched? I narrowed it down to the top few choices in each category and then did some research on the manufacturers. Where did they source their ingredients? Have there been any recalls on their products? This helped me narrow it down to what is the best dog food brand choice in each category. My research was mainly done online, aside from my own product testing. As I mentioned, I did speak with my veterinarian, and I also looked for information from other experts in the field. There have been many studies performed on the canine diet and the commercial dog food industry, and I used many of these in my research as well . After all of the research, reading and product testing I chose The Honest Kitchen’s Dehydrated Dog Food Formula as my pick for the best dog food brand available on the market. For the purpose of this review, I purchased the turkey recipe, but it’s also available in chicken, fish and beef varieties. I also selected the grain free variety, but you can choose from their whole grain formulas too. This is an all-natural, dehydrated dog food with added vitamins and minerals. It is made with cage free turkey and offers complete and balanced nutrition for puppies and adult dogs. If you’ve never used dehydrated food, it’s a bit more work than traditional kibble but the health benefits are numerous. The Honest Kitchen’s Dehydrated Dog Food Formula has no preservatives, by-products, fillers, artificial or GMO ingredients. It’s also wheat, corn and soy free. Dehydrated food comes in powder form. You mix the dog food with warm water, stir it well and then leave it to sit for 3 minutes. Other dehydrated dog foods may need to sit for 15-20 minutes, but they will have the exact instructions on the packaging. I found that this dog food was still a bit runny after 3 minutes, so I actually let it sit for about 10 minutes before serving it to my dogs. You can make up enough food for 2-3 days and leave it in the refrigerator if you’d like. That way you don’t have to try and remember to premix food every day. Each box of dog food from The Honest Kitchen contains many wholesome ingredients. I purchase this food in 2 pound boxes, which makes 8 pounds of dog food when you mix it with water. This information is listed on the company’s website for each dog food variety that they sell. I like to look for products that are made in the United States. With all the recent recalls and issues that have been popping up with pet products, it’s comforting to buy a product that is made here in the U.S. Within a week of switching to this best dog food brand from The Honest Kitchen, we noticed some changes in our dogs. I was already feeding them a quality dog food, but it wasn’t dehydrated and didn’t offer all the added nutrients that this food does. We noticed an improvement in the shine of our dogs’ coats, and I also noticed an increase in our 5-year-old boxer’s energy level. The feeding requirements of this food are less than the dry kibble that we were previously feeding our girls, and less food means less waste. We also noticed a reduction in the amount of gas they had, which means their digestion is better – a common benefit to dehydrated and wet dog food formulas. Our boxer also lost a little weight in the few weeks that we have been feeding her this food. Poor commercial food has been linked to canine obesity, but our girl was certainly not obese. I was impressed that she lost 3 pounds though. That just showed me that her previous diet did have a higher fat content than she needed . The Honest Kitchen Recipes were highly recommended by many experts in the field of canine nutrition. Pet owners also rave about the health improvements that their pets have made since switching to this best dog food brand. Even pet owners like myself, who switched from a high-quality dry kibble, saw positive results when they switched to this dehydrated food. There really aren’t any drawbacks to this food from a nutritional standpoint. Because it comes in so many varieties and you can choose from grain-free or whole grain options, it’s really a great food to feed any dog. It’s also formulated for dogs of all ages, so it’s ideal for a multi-dog household. The one downside to switching your pet to dehydrated dog food from The Honest Kitchen is the price. The price varies slightly depending on the blend that you select, but the grain-free turkey recipe that I chose costs about $85 for 10 pounds of dehydrated food (which will make 40 pounds of dog food when mixed with water). The feeding guidelines vary based on your dog’s weight and activity level. Our girls are both between 51 and 70 pounds, and they are both average in the activity department. That means that they each need 2-2.5 cups of The Honest Kitchen’s Dehydrated Dog Food every day – split between morning and night. Doing the math, a 10-pound box would last us about 10 days. That means we will spend approximately $255 per month on dog food for both of our girls. That’s more than $3,000 on dog food each year! I know that isn’t in everyone’s budget, but think about the cost savings if your pet is healthier. That means fewer vet visits, fewer supplements and fewer medications . It wouldn’t take long to save thousands of dollars each year at that rate. Dry kibble is the most popular diet fed to domestic canines. If you prefer to feed your dog grain-free kibble, Taste of the Wild Dry Dog Food is the best grain free dog food brand. This company bases their dog food formulas off of the diets of wild dogs. Many experts believe that domestic canines still crave the meat, fruits and vegetables that their ancestors ate in the wild. Your veterinarian can perform a nutritional assessment on your dog and give you his exact dietary needs. Based on his medical history, breed, size, weight, physical condition and other variables, your vet will be able to tell you what specific dietary needs that your dog may have. For example, puppies may need food with a higher protein content and less active dogs may require a diet that is low in fat . The best grain free dog food brand from Taste of the Wild is made with real roasted meats. The food is supplemented with vegetables and fruits. These dry dog food recipes are grain-free and packed with natural antioxidants that will benefit your pet’s overall health and well-being. The proteins are highly digestible as well. All their dry dog food recipes are also fortified with K9 Strain Probiotics to support your dog’s digestive tract. They offer varieties that are specifically formulated for senior dogs, adult dogs, puppies and nursing or pregnant females. You can find the nutritional information, ingredients and specific feeding guidelines for each recipe on Taste of the Wild’s website. The minimum protein in all the blends runs between 25-32%. The calorie count is between 337 and 375 per cup depending on the formula that you choose. Searching for a new brand of dog food is a tedious task. There are so many options available and they all have their own benefits and drawbacks. Which diet should you choose – raw, organic, dry kibble…? The best thing to do is have a conversation with your dog’s veterinarian being trying any of the best dog food options. Your vet will explain your dog’s nutritional needs and which best dog food brand diet would be best for him. Similar to dehydrated products, Grandma Lucy’s offers freeze-dried dog food with many of the same benefits. The company uses all-natural ingredients to make grain-free, freeze-dried dog food with no preservatives or GMOs. These products are made in the United States as well. 87% of the ingredients in their dog food are sourced here in the U.S. too. The rest come from Canada, Costa Rica, Peru, Brazil, Australia and New Zealand. Grandma Lucy’s Grain-Free Freeze Dried Dog Food comes in a variety of flavors including chicken, venison, pork, lamb, bison, rabbit, fish and goat. No meat meals or by-products are ever used in the making of their pet food. Freeze-dried food needs to be mixed with water, just like dehydrated food. Grandma Lucy’s recommends that you mix the food and let it sit for 3 minutes, and you can also refrigerate the food for 2-3 days if you’d like to make some in advance. Although there is a bit of prep time for this food, the health benefits are incomparable to traditional commercial dry kibble diets. Researchers have been busy looking for links between some of the common ingredients in commercial pet food and the increased rate of canine cancer. No solid proof has been found yet, but many experts in the field are urging pet owners to stay away from foods containing artificial ingredients and GMOs . If you’re thinking about switching your Fido to an organic diet, Natural Planet Organics Adult Formula Dry Dog Food is a great choice. This best dog food brand is made with free range chicken and organic grains. It’s also formulated with vegetables and preserved naturally. This dog food is also formulated to meet the needs of dogs of all ages. 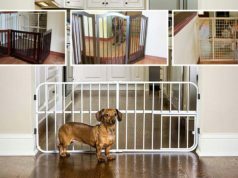 If you have a multi-pet household, like mine this is a great choice. I got really tired of buying different formulas of dog food for each of our dogs, so I spoke to our vet and switched to a blend that is formulated for dogs of all ages. It’s up to you and your vet, but if this type of diet will meet your dogs’ needs it will save you time and money. Natural Planet Organics incorporates necessary supplements into their pet food like proteinated minerals and vitamins. There are higher levels of Omega-3 and Omega-6 fatty acids than most other commercial dry kibbles as well. These supplements are important in building and strengthening muslces, and omega fatty acids aid in skin and coat health. Even with all the healthy options on the market, some pet parents feel more comfortable making their dog food themselves. This is a nice option, as you can choose the ingredients that you add and control what types of foods (organic, all-natural, etc…) that you make the food with. The drawback to homemade food is all the prep time. You’ll need to shop for the food and prepare it in advance. Even if you’re feeding a raw diet you have to wash all the fruits and vegetables and chop up all the ingredients. To make things easier you could buy a dog food base, like this one from Dr. Harvey’s. Bases are a great way to get homemade food quality without all the work. Dr. Harvey’s Canine Healthy Dry Dog Food is a holistic blend of 9 dehydrated vegetables and 6 organic grains. All you have to do is add a meat and oil of your choice, and your pup will have a balanced, nutritional meal. You have full control over the protein content in your dog’s food, and this all-natural formula has no preservatives, dyes or chemicals. When you hear the name Rachel Ray, you probably think of delicious creations crafted in the kitchen. Did you know she cooks up dog food too? Rachel Ray Nutrish Just 6 Dry Dog Food did not make this list because of its celebrity namesake. I included this best dog food brand because of the top quality ingredients and palatable recipes offered by the brand. Vitamins and chelated minerals like folic acid, vitamin D3 supplement, iron proteinate and biotin are the only other ingredients. A full list of all the added vitamins and mineral are available on the company’s website. This food is ideal for pets with food allergies, since it contains no corn, wheat or soy. It’s a natural dog food with no artificial preservatives, colors or flavors. Canine obesity is a growing epidemic, and unfortunately the cure is very simple. Pet owners need to get serious about their dog’s diet and educate themselves about the serious dangers of dog obesity. Not only will being overweight make your dog feel sluggish, it can lead to some very serious health conditions like heart problems, certain types of cancer and early death . If your dog is overweight you need to act now! Speak with your vet about the best diet for your dog and do some research on dog food that is specifically formulated to help your dog shed pounds. Nutro Ultra Weight Management Dog Food is my choice for the best dog food brand for weight management. The formula is designed to help less active and overweight dogs shed pounds and maintain a healthy weight. This best dog food brand is made with a protein blend of three lean meats and other ingredients such as rolled oats and vine-ripened tomatoes that foster heart health. This best dog food brand from Nutro Ultra contains ingredients to promote skin and coat health, strong muscles and a strong immune system. It is made from lean, all-natural ingredients that are formulated to provide complete nutrition for adult dogs. The blend includes natural sources of glucosamine and chondroitin to promote healthy joints, as overweight dogs are more susceptible to hip and joint problems. The study of canine nutrition is just getting started. Research into the best diet for dogs, the links between nutrition and disease and even the ingredients in commercial dog foods have just begun. There is still so much left to learn, and you can be sure that experts in the field will continue working in this field . The trends in pet foods often mimic the trends in the human food industry. Currently health and sustainability are the two biggest movements in both markets. Researchers have quickly begun to realize that with the increasing human population and the increasing pet population we won’t be able to feed everyone forever. New developments in sustainability and nutrition are on the horizon, and it will benefit both you and your pet if you take notice of them. The one thing that we know for sure is that nutrition is directly linked to overall health and well-being – and that’s as true for our dogs as it is for us. Staying on top of the latest research in canine nutrition will help you feed and care for your pet in the best way possible. We love our dogs. They are like furry family members. The worst thing about being a dog owner is that we live much longer than our canine companions. If you want your pet to have the healthiest, happiest and longest life possible you need to feed him the best dog food brand to meet his nutritional needs. It’s no secret that the best dog food brand will cost you more money up front, but think of the savings that you’ll get in the long run. Better nutrition means a healthier dog, so you’ll end up spending less in veterinary care over the course of his lifetime. High-quality dog food offers added supplements for optimum health. This means you won’t have to pay for common dietary supplements like glucosamine and chondroitin, omega fatty acids and pre- and probiotics. The best dog food brand should be a necessity when thinking about adopting a dog. Speak with your veterinarian before adopting to discuss the best dietary options for the dog that you’re considering. Be sure to check out how much that dog food will cost you and make sure that you can afford it. If not, you need to wait and adopt a canine companion when you can afford the best care for him. Photos of the The Honest Kitchen's Dehydrated Dog Food and the video review of the best dog food brand by Samantha Randall © Top Dog Tips. All rights are reserved.